Description: Level: Aimed at engineers, managers, enterprise design engineers and managers, supply chain engineers, manufacturing systems engineers, IT, management and science students and professionals, quality control engineers, product / process designers, and manufacturing/ assembly system designers and integrators, interested to learn about intelligent enterprise design concepts. Several sections and cases could be ideal for undergraduate and graduate education learning/ exploring related concepts and technology. Industrial Sponsors/ Contributors include with special thanks to Peter T. Rayson, The Technology Innovation Centre (Tic) and UCE Birmingham, UK, CIMware Ltd. UK, CIMware USA, Inc., and others. 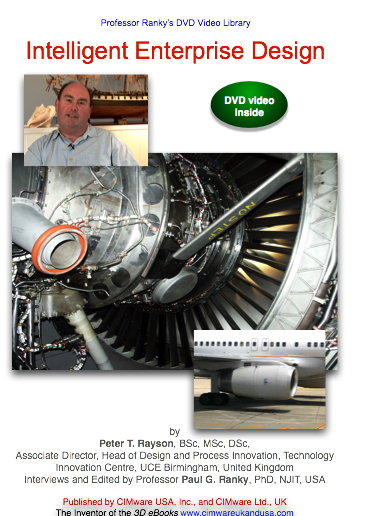 Contents: This electronic publication is a professional quality DVD video presentation by Peter T. Rayson, Associate Director, Technology Innovation Centre, UCE Birmingham, UK. Dr. Rayson has over 30 years of professional experience in CAD, CAM, CAE, PLM (Product Lifecycle management), advanced manufacturing and automation, and collaborative digital enterprise design and management, primarily in the aerospace and in the machine tool industries. The discussion topics and application examples include a brief overview of past, current and future product, process and enterprise design principles and methods. Then he focuses on future challenges intelligent enterprise designers will have to face. Towards the second half of the video Dr. Rayson gives a novel insight of the way the global economy will require such resources in the future. What you will learn: Having watched the DVD video, you will be able to understand the way digital factories and intelligent enterprises will create products, processes and service systems in the future. System Requirements: DVD-ROM: NTSC standard definition (SD) DVD video player for TV, or computer. Approximate length 39 minutes, in 16:9 wide screen format, or any good computer screen (min. 800 x 600 resolution). The video is also available in PAL, as well as for the Video iPod. Please visit www.cimwareukandusa.com for available formats and further products. This video will also be available in Hi-def DVD format as soon as the standards and players are available.